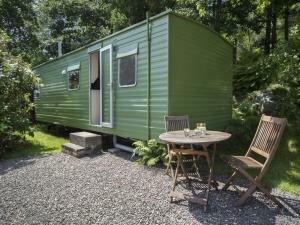 Retro Caravan at Manesty017687 77216work017687 77384fax Individual CaravanOur static caravan is nestled at the edge of a small wood in the beautiful valley of Borrowdale in the heart of the English Lake District. It's a cool and affordable glamping style holiday in a stunning countryside setting. It's particularly great value for week long stays. The caravan has many of the original fittings and has been really well cared for - we'd call it 'good vintage condition'. We've gone with the 70's vibe with the accessories! There is a double room and the second bedroom can be either a double or a twin (it has two 2ft beds). The fully equipped galley kitchen extends to a spacious living/dining area. The wooded fell is behind the caravan and to the front are fabulous views across the valley. The wood is home to our resident tawny owl, red squirrels and woodpeckers. So, it's great for wildlife enthusiasts as the birds can also be watched from inside at the breakfast table or from the sofa. Outside, there's parking for one car (more nearby if you need it) and picnic tables and chairs to enjoy the views. Manesty is less than a mile from the Derwentwater lakeshore and about the same distance from the pretty village of Grange, with it's teashops and double hump-backed bridge over the River Derwent. The 'Honister Ramber' bus takes you into Keswick from the doorstep between Easter and November, or the launch runs all-year round, as does a bus from Grange. We're in a perfect location for walks, water sports, touring the villages, or just sitting back to relax! We provide all our guests with our 'walks from the door' which we have written ourselves: 11 walks of varying lengths that you can enjoy straight out of the gate. 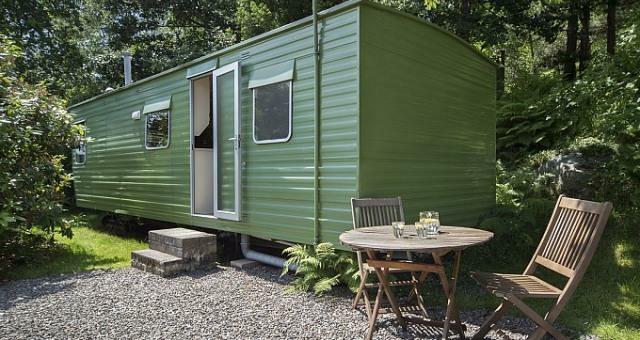 Retro Caravan at Manesty offers weekly bookings starting on Saturday. Retro caravan with 2 bedrooms, galley kitchen and dining/living room area. 1 double room, 1 twin or double room. Shower/wc room with shower over hip bath. Outside furniture and wonderful views. Price is per unit for up to 4 guests. Bed linen and electricity included. Towels available for £1 each if you wish. Hot tub additional £25 per day if you wish. Retro Caravan offers weekly bookings starting on Saturday. Excellent location. All in the caravan as advertised. Friendly, helpful and unobtrusive hosts. Our static caravan is nestled at the edge of a small wood in the beautiful valley of Borrowdale in the heart of the English Lake District. It's a cool and affordable glamping style holiday in a stunning countryside setting. It's particularly great value for week long stays. Our family have lived at Manesty, a traditional Lakeland farmstead in Borrowdale, for nearly 200 years and have a long history of welcoming visitors to share our beautiful part of the world. We live in the house near the original farmstead built by Alan's father and grandfather and let the original farmhouse and converted barns as holiday cottages. We're here to help you get the best out of your stay if you want and are always happy to offer advice. Free Sat TV. Shower room/wc with shower over hip bath. Laundry room with washer, dryer, games cupboard and library shared with the holiday cottages. Kitchen: the 4 cubic ft refrigerator has a small ice box. There is no dishwasher, microwave or toaster. We can provide a microwave and toaster by request if you wish. Heating: electric. Hot Water: there is instantaneous electric water heating. Outdoor wood fired hot tub available to book for exclusive use by the day. Children welcome from any age. Leave M6 at jnc 40 (Penrith) on A66 west. Follow for 17 miles to Keswick. From Keswick follow B5289 and signs for Borrowdale. After 4 miles, turn right over the double humped bridge, signposted Grange and Newlands. Manesty is ¾ mile beyound the village (Grange) on the left hand side. Take the train to Penrith. From Penrith take the X4 or X5 bus to Keswick. From Keswick take the 78 bus to Grange and walk ¾ mile after going over the bridge to Manesty or tale 77 (senic) or 77A (direct) bus to Manesty (Easter - Oct).